Papa John's announced late Wednesday that John Schnatter, who last year made controversial remarks about protesting African-American football players, apologized after a report emerged that he used a a racial slur during a conference call in May. Forbes said Schnatter used the N-word during a media training exercise. When asked how he would distance himself from racist groups, Schnatter reportedly complained that Colonel Sanders of Kentucky Fried Chicken fame never faced a backlash for using the word. In a statement released by Louisville, Ky.-based Papa John's, Schnatter said reports attributing use of "inappropriate and hurtful" language to him were true. "Regardless of the context, I apologize," the statement said. "Simply stated, racism has no place in our society." 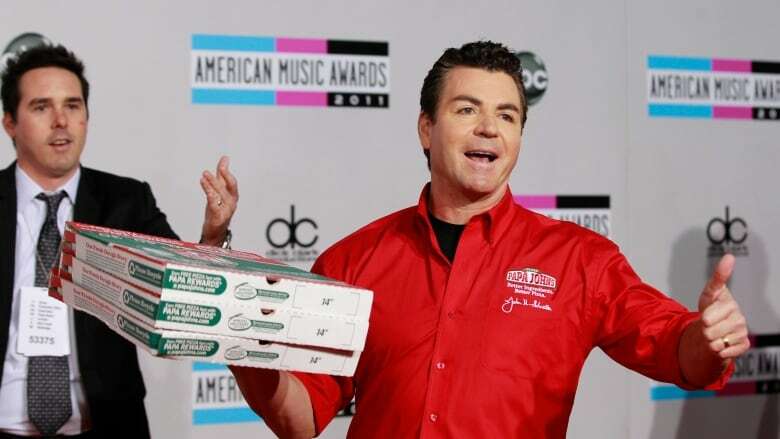 Schnatter opened the first Papa John's in Jeffersonville, Ind., in 1985, according to the company's website, and has been among the more high-profile CEOs in the U.S., appearing in commercials for his chain. The company has frequently bought ad time during NFL games and hired star quarterback Peyton Manning to appear in its commercials. Schnatter stepped down as CEO last December after blaming slowing sales growth on the outcry surrounding football players kneeling during the national anthem. Papa John's opened its first location in Canada in Alberta in 2000 and now has 127 Canadian franchise locations, according to the trade publication Canadian Business Franchise. Papa John's shares fell nearly five per cent Wednesday on the NYSE after the Forbes report, closing at $48.33, rebounding over six per cent as of 9 a.m., to $51.44.